A mean green fighting machine? Or a mean clean one? Since my “Green Plate Special” cookbook was released in May, I’ve been out there flacking it, as they call it in the publishing business. I’ve held signings in bookstores, had readings in schools, served cook-the-book dinners in restaurants, spoken at libraries, and passed out samples of food derived from the book’s recipes at farmers markets up and down the East Coast. Most of the questions I get about its contents I can readily answer. But one had me stumped – until, that is, I researched and formulated a succinct reply. The question? The answer requires another question – who benefits? Green eating fills the body with food that was grown, sourced, prepared and not wasted in a fashion that feeds a body, yes, but also considers the environmental impact of food production and safeguards agriculture and energy resources for future generations. Clean eating practices feed your own body to maximize your own energy and optimize your own personal health. I make no (sanctimonious or otherwise) claims about which of these lifestyle-driven ways of eating is better for a single body or for the greater good. I am writing to point out the intersection of the two philosophies and to shine some light on the best of both worlds. Think Venn diagram. The green eating circle would include sourcing food of all sorts – vegetables, animal proteins, dairy products, whole grains – whenever possible from local farmers and value-added producers who are dedicated to sustainable agricultural and processing practices. It also requires choosing foodstuffs that are minimally packaged. Green eaters look to swap out trucked-in processed ingredients for locally available natural ones (think honey over white sugar) and likewise opt for homemade staples over highly processed purchased ones (DIY crackers, for one, are a breeze). They minimize their use of fossil fuels and water when they cook, and they keep a close eye on food use, so as to not waste a morsel. Finally, practical green eating allows for flexibility in accordance to an eater’s time and resources. Sustainable eating mileage varies, but it all add up in the end. The clean eating circle, at least in one of its iterations, centers on eating mostly fresh (organic is best) vegetables, nuts and whole grains in concert and in small amounts five to six times a day. The practice also includes avoiding processed foods (aka cooking more of your own food), reducing the amount of animal proteins on the plate, minimizing dairy product intake (nut milks are the most common substitute), avoiding processed sugars (leaning toward honey and away from white sugar), substituting coconut oil for almost any other fat and drinking mostly water. The stricter you, as an eater, adhere to these principles, the cleaner your personal lifestyle will be, and hopefully increased energy and other good health benefits are more evident. While not a total eclipse, the Venn optics definitely show the two lifestyles to be reasonably simpatico. It’s really just a matter of your point of view. 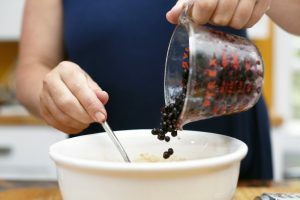 Christine Burns Rudalevige adds 3 tablespoons of Maine maple syrup to a pan to make a glaze for a Maple Blueberry Tea Cake. This recipe, adapted from one in Melissa Clark’s “Cook This Now: 120 Dishes You Can’t Wait to Make,” was one of the first ones I made in my new kitchen when I moved to Maine in August 2012. The blueberries were plentiful and the desire for new friends to come to tea was great. Given that it’s late September, I am happy to report that frozen blueberries work well in this recipe. For the flour, I use Maine Grains, and I like to use a mix of local low- and high-bush berries. Should you also want to eat clean as well as green, you can substitute coconut milk and melted coconut oil in equal measure for the buttermilk and melted butter. I haven’t (yet?) found a clean version of powdered sugar, but you can find organic versions in most health food stores. 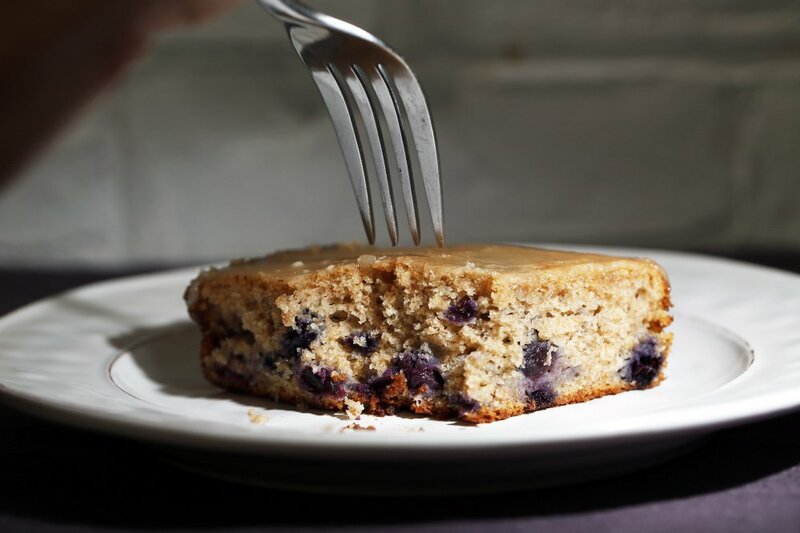 A cup of Maine blueberries go into the tea cake batter. To make the cake, preheat the oven to 400 degrees F. Use a butter wrapper to lightly grease an 8-inch square pan. Whisk together the flour, baking powder, baking soda, salt and cinnamon in a large bowl. Whisk together the melted butter, maple syrup, buttermilk and egg in a large measuring cup. Pour the wet mixture into the dry mixture and stir until just combined. Gently fold in the blueberries. Pour the batter into the prepared pan and bake for about 25 minutes, until the cake is golden brown and a toothpick inserted into the middle comes out clean. While the cake is cooling, make the glaze. 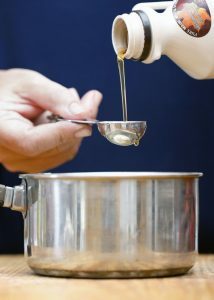 Combine the butter, maple syrup and salt in a small saucepan. Place the pan over medium heat and bring to a simmer. Stir in the confectioners’ sugar until smooth. Pour the glaze over the cooled cake. Store at room temperature for up to 48 hours. I doubt there will be any left after 2 days in plain sight, but refrigerate the cake if there is.